Vocabulary becomes difficult when students are expected to memorize long lists of words...especially when that's on top of the new terminology they're learning in math, science, English, literature, and practically every other subject! Teach them how to actually figure out new words with BJU Press! Students will explore vocabulary principles, including where English came from, what common prefixes, roots and suffixes mean, and how we can discern the meaning of new words based on previously understood concepts. Contextual exercises model the correct use of a word, while fill-in-the-blank, writing, games and other types of exercises provide continual practice. Cumulative Reviews included. 49 pages with index, softcover. Grade 8. 3rd Edition. This resource is also known as Bob Jones Vocabulary Student Worktext, Level B (Grade 8), 3rd Edition. The Teacher's Edition contains the Student Worktext with answer overprint and presents new words in each lesson with games, puzzles, and reinforcement activities to build vocabulary and to keep students ready to learn. This teacher's guide accompanies Vocabulary Student Worktext, Level B, Grade 8, 3rd Ed. 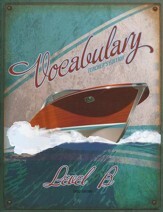 This resource is also known as Bob Jones Vocabulary Teacher's Edition, Level B, Grade 8, 3rd Edition.